We enjoyed it very much and the size of the house was ample enough to allow each family member their own space as needed. Dylan was very kind and responsive our questions and needs. Beautiful, stylish condo with a great location and amazing view from porch. Updated amenities, including a full-size kitchen and lovely full-size bedroom with two full baths. Perfect for a couple looking to get away or a small family of 3-4. Much more space than many of the carriage house rentals in Rosemary Beach. Our stay was very enjoyable. If I had to make any suggestions, I would supply more hangers. The closet was a good size but unusable since we only had 2 hangers. Also, more hooks or other organizational/storage options for the bunk area. Celia was professional, helpful, and timely in getting back with questions regarding our reservation, access to the property, and any and all other questions. We thank you very much! The condo/apartment was lovely and professionally decorated with all of the latest amenities. It was the prefect size for the 3 of us, one couple and one single. Celia was so very helpful and very quick to respond to any questions or concerns. We loved #3 Barrett and can't wait to visit again. 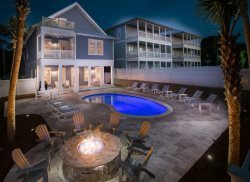 It is in the perfect location for walking to dinner, shopping or the beach. The green out front was great to watch all of the entertainment provided right from our porch. The property was very well maintained and very clean. We were very comfortable and at home there. Excellent home; very-well equipped kitchen; very nice sound system; very clean; nice to have beach chairs and umbrellas if needed; Carriage House apartment was perfect. Loved the screened porch area and the backyard area was very nice for RB. Nice to have a garage in which to put bikes and other stuff.